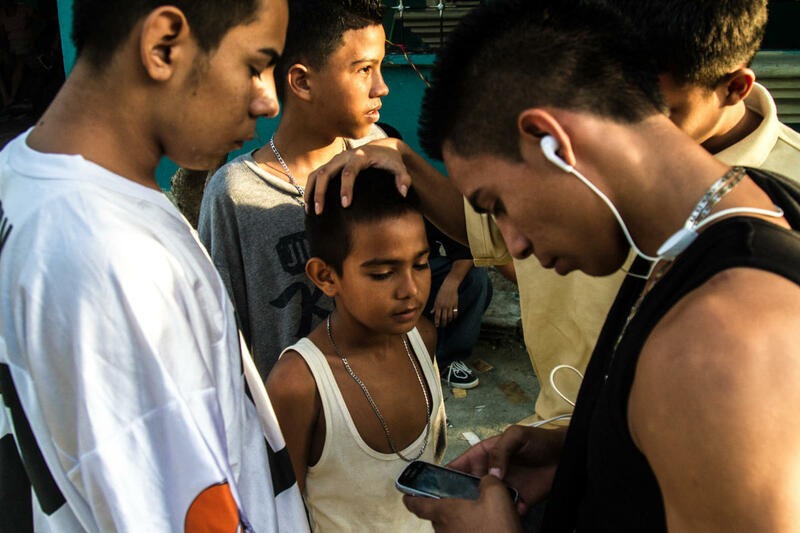 A group of older boys, some of whom are gang members, joke around with a younger boy. Neighborhood children are often groomed for gang activity from the age of 6 or 7. At first they may be given small assignments — like buying snacks for gang members or monitoring who's coming in and out of a neighborhood, says Ayuso. Bit by bit, he says, they graduate into bigger responsibilities. 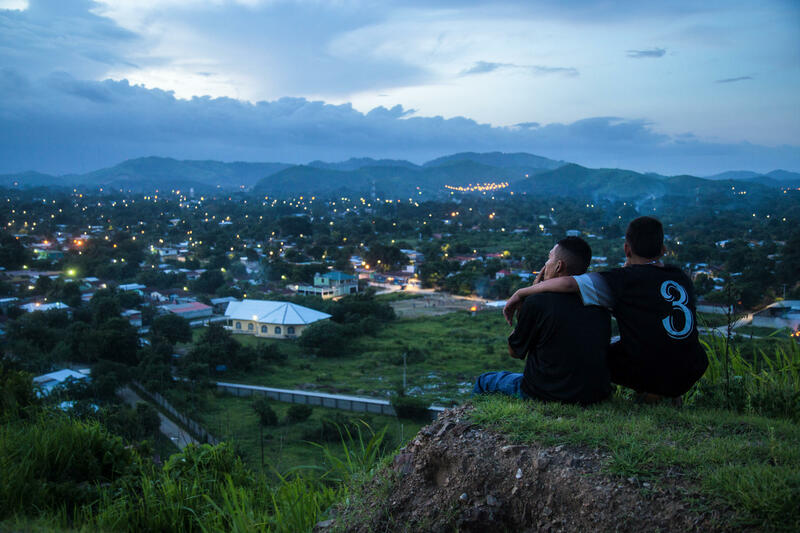 Moises, 17, left, and Jaime look down on the patchwork of neighborhoods outside San Pedro Sula, a city in Honduras where gang rivalries play out. The violence is so bad that "no one goes in" the neighborhoods, says photojournalist Tomas Ayuso. "Food delivery trucks, ambulances don't want to go in because they're afraid something will happen." 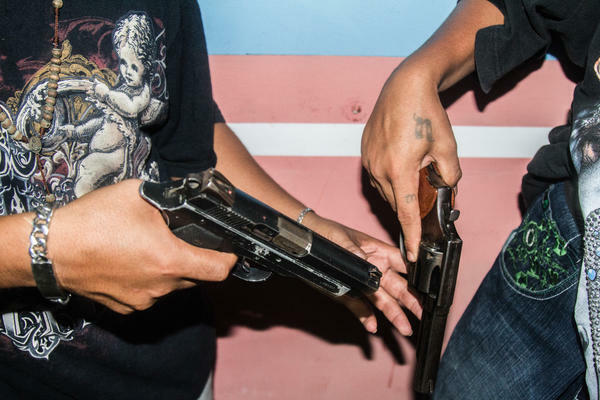 Before heading out on night patrol, gang members inspect their weapons in San Pedro Sula. Tavo, right, and his son Moises in the maize plot by their house. 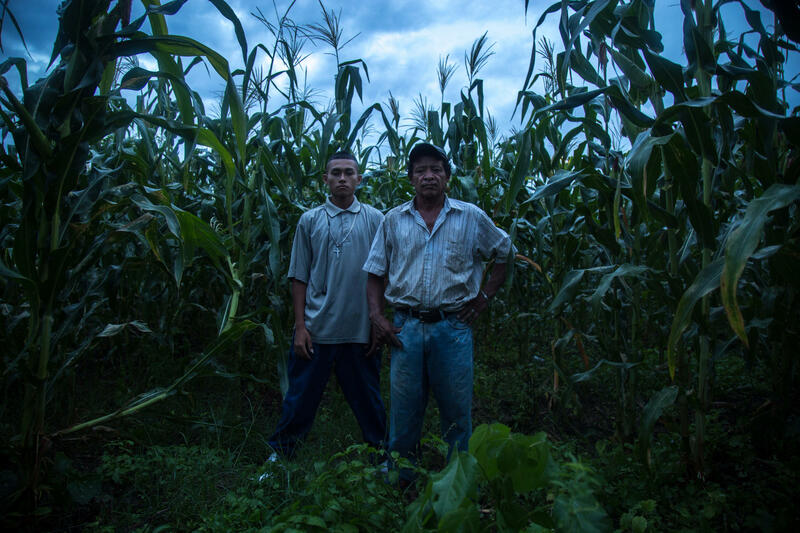 Ayuso heard Tavo tell his son to flee the country, explaining: "Honduras stopped caring about its people and started eating its young." With storms brewing above, Tavo then clasped his hands and said, "I beg you God, have mercy on my boy." Moises and his girlfriend, Cindi, discuss their future. When Ayuso took this photo, she had just told Moises that she is pregnant. They discussed their options; Moises said he would consider migrating to save himself from gang violence — and be able to make money for the child. A gang member protects a block of their turf in San Pedro Sula. The decades-long fighting has made enemies of people who might live just a block away from each other, says Ayuso. 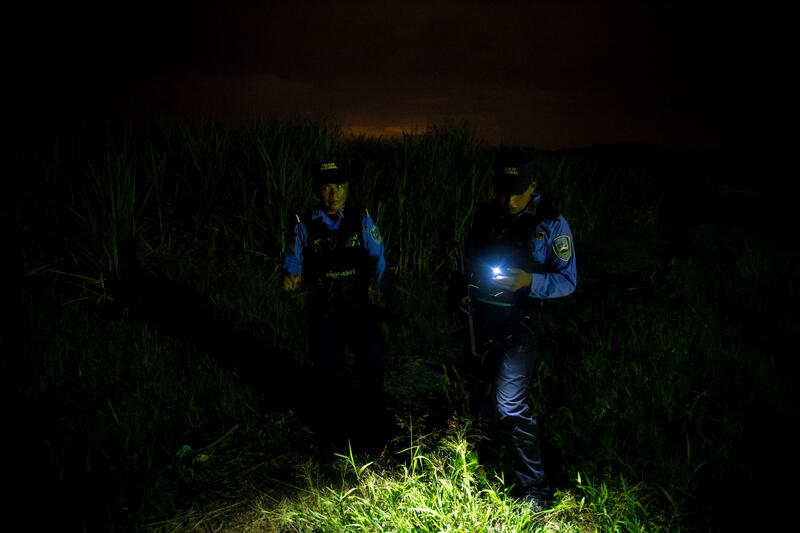 Police stand before a site where bodies are dumped in San Pedro Sula, investigating the latest corpse. 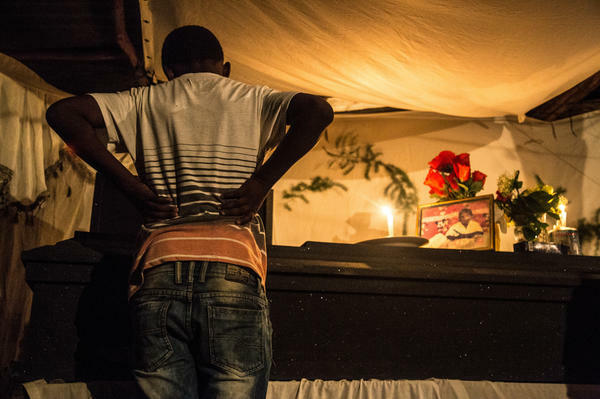 "It was another body in a potato sack, contorted to fit in the bag," says Ayuso. A boy looks into the casket of 16-year-old Leo, who was lynched by gang members, allegedly for using slang associated with a gang in a rival neighborhood of his barrio. Leo's mother said she wanted an open casket so people could see what they did to her son. "His body was destroyed," says Ayuso. Chino, left, and his friend Tito cool off at a gang house in San Pedro Sula. Chino joined a gang at 14 and has the privileges that come with being a member: respect, fear, power — but also "a cell phone and chains," says Ayuso. Ayuso also heard Tito — who is not in a gang — say he hopes to be like Chino someday. Cindi and her baby girl in San Pedro Sula. Her boyfriend Moises left the neighborhood a few months after she became pregnant. Cindi sent photos of the baby to Moises via WhatsApp. But a few weeks ago, he stopped responding to her texts, which worries Cindi. She hopes that Moises is OK and that she will hear from him again soon. He picked that title because for many Hondurans, he says, especially young men in low-income urban communities, "the right to grow old has been destroyed. One has to fight for their right to grow old, either by migrating out of the country or enlisting in a gang for protection. But it's not a given." 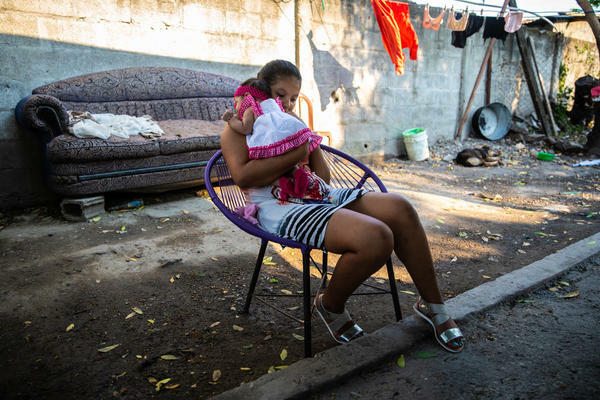 Many of his images are set on the outskirts of San Pedro Sula, a Honduran city of 850,000 that is one of the most violent in the world, with 142 homicides for every 100,000 people, according to 2015 data. Ayuso says he aims to show "the complex and difficult environments and choices facing youth in these neighborhoods" and follows the story of a teenager named Moises, who was being recruited by a gang. Like many parts of the country, the city struggles with poverty, crime and corruption. 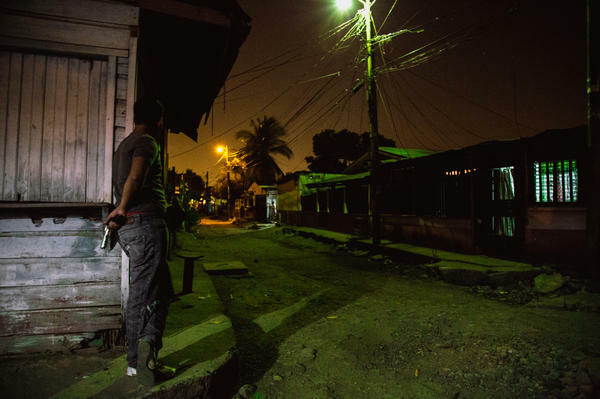 Boys are often forced to join gangs, according to a 2016 report by Insight Crime, a foundation that studies crime in Latin America and the Caribbean, and USAID. The violence is causing Hondurans to leave the country. From the time period of 2011 to 2016, 7,350 Hondurans sought asylum in U.S. immigration courts, a 166 percent increase from the previous six-year period, according to data from Syracuse University. Even amid the turmoil, Ayuso found moments of love and friendship: A couple comforts each other after a life-changing announcement; two friends atop a hill look down at the glittering lights of their neighborhood. Ayuso was able to win the trust of gang members and locals by spending time with them and making his intentions clear — "I'm capturing their stories," he says. Ayuso, who had worked in the U.S. as a researcher on conflict in Mexico and Central America, took up photography in 2015. In 2016, he was a fellow at the International Reporting Project. He splits his time between Honduras, El Salvador and Mexico. Here is a selection of images from his project.